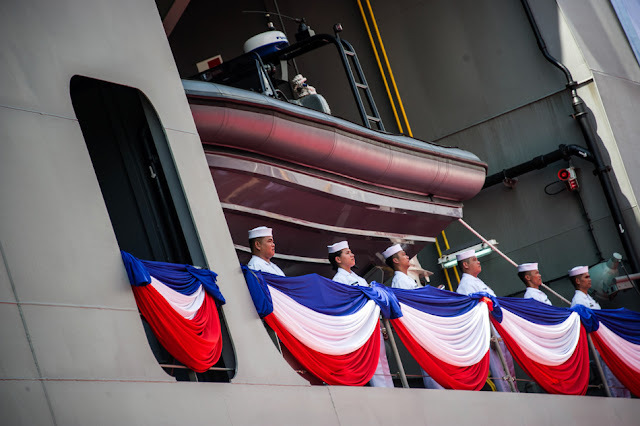 MANILA, May 9 -- Welcome ceremonies for the Philippine Navy's (PN) second strategic sealift vessel(SSV), the BRP Davao Del Sur (LD-602), and her crew will be held at Pier 13, South Harbor, Manila Wednesday afternoon, spokesperson Capt. Lued Lincuna has said. "The Commander of the Philippine Fleet, Rear Adm. Gaudencio C. Collado Jr. will spearhead the ceremony as representative of the Flag-Officer-in-Command of the Philippine Navy. Highlight of the event will be the tribute to and recognition of the laudable efforts of the sailors who are instrumental in the ship’s safe and successful voyage to the Philippines," Lincuna told the Philippine News Agency (PNA) in a message. The ship arrived and anchored off Pier 13, Manila South Harbor at about 11 a.m. Monday after her departure from the PT PAL (Persero) shipyard in Surabaya, Indonesia last May 4, and was set to undergo customs, immigration, quarantine and security procedures, he added. Lincuna said the second SSV will boost the Navy's capability to conduct humanitarian assistance and disaster relief missions, alongside its troop and cargo missions. The BRP Davao Del Sur, launched on Sept. 29 last year, is the sister ship of the BRP Tarlac (LD-601), currently the largest Filipino warship in commission. BRP Tarlac was commissioned on June 1 last year. BRP Davao Del Sur is also a Makassar-class landing platform dock like the BRP Tarlac. The two-unit SSV procurement project had an approved budget contract of PHP4 billion, sourced from the AFP Modernization Act Trust Fund. Just like the BRP Tarlac, BRP Davao del Sur will serve as a floating command-and-control ship, especially in the conduct of humanitarian assistance and disaster response and will also serve as a military sealift and transport vessel. The ship has an overall length of 120 meters,breadth of 21 meters, draft of 5 meters, and can carry a payload of 2,800 tons. She has a cruising speed of 13 knots, a maximum speed of 16 knots, and a minimum operating range of 7,500 nautical miles.